Beloved and I had brunch at Snack Shack. I’ve been to this place many times before, and have been wanting to visit it with Beloved because she holds the camera. Now, I’ll try not to spoil much before we get to the pics, but I’m quite excited writing about this one. The place is literally a shack. Located at V. Luna Extension, close to Savemore Supermarket, it’s a very small place where only a maximum of four people can be accommodated with the bar table. However, the place is really made for take-outs and stand-ins (and perhaps deliveries). As for the “snack” part, there’s actually just four (then, when we visited now there’s five) items on their menu composed of two categories: burgers and sausages, both in buns. There are two kinds of burgers, their Quarter-Pounder with Cheese (70 Php) and Half-Pounder with Double Cheese (135 Php). Yep, you read that right—that’s a quarter pound burger for less than 100 Php; by far the best deal pound-by-pound of all the burger places we’ve been to. As for their sausages, there’s the mildly spiced Bockwurst with Cheese (90 Php) and the curry-spiced Currywurst (90 Php). Now, they have the spicy Hungarian (90 Php). You can customize your burger with different add-ons for 20 Php each: Jalapeño peppers, Blue cheese, Cream cheese, Garlic ranch, Garlic chips, and Barbecue sauce. You can also add Extra cheese for 15 Php. Beloved had their Half-Pounder with Double Cheese with Blue Cheese add-on (155 Php total) and I had, as I have always had since I first visited, their no-frills attached Half-Pounder with Double Cheese (135 Php). I had their Bockwurst before, so this time, I also ordered their Currywurst (90 Php) just to try it out. It’s a humongous patty indeed. Not the largest in either width or height, but it’s evidently a half-pound burger. Aside from being freshly prepared, there’s nothing special with the rest of the ingredients—the veggies and buns and cheese, I mean. 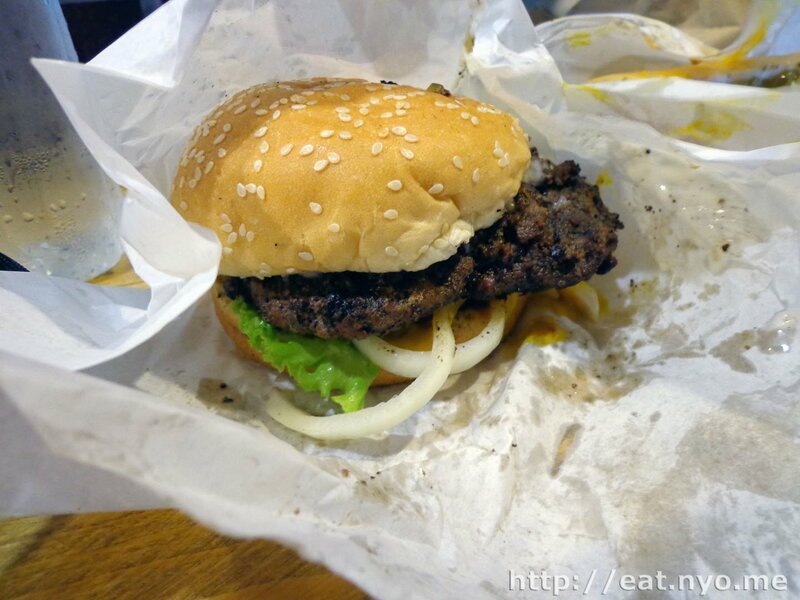 However, all my claims that this is the best burger in Metro Manila is because of the meat. It’s not some kind of “proudly imported from US/Australia/Japan” beef, no. It’s “proudly 100% local Batangus” beef. I haven’t asked them what that means, but I assume it’s beef from Batangas. I applaud any food place that takes pride in local ingredients, so it’s a plus point for me. Of course, that means nothing if it doesn’t taste good. It tastes divine! It has an amazingly crumbly texture with every bite. Now, I quite enjoy that texture in itself. But what’s amazing is every granule of beef is very juicy—it’s like eating hundreds of tiny amazingly delicious and juicy burgers. The smoky, meaty flavor itself rivals any of the imported beefs I’ve tasted before, and I actually have developed a preference for the taste of this particular meat. They also cook it perfectly—nicely seared on the outside while still soft and juicy inside and not at all burnt. The most amazing part is, even after downing half a pound of Batangus, I still want more. This happens all the time, from my first visit up to the visit I did the day before (this particular visit was a couple of weeks ago), each visit never degrading in novelty, which makes me think that this burger has some addictive additive of some kind. Speaking of the day before, I passed by because I was suggested to eat greasy food while re-hydrating myself to relieve my hangover. 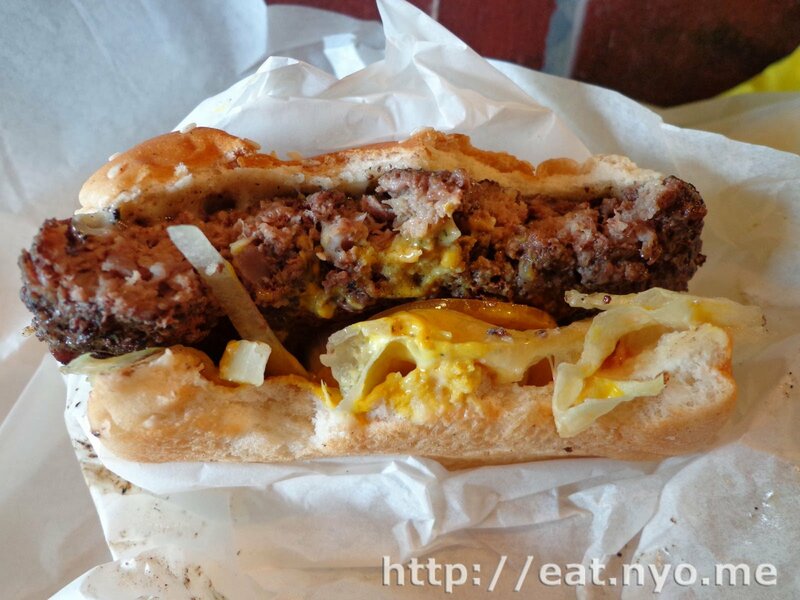 After consuming a Half-Pounder, I was immediately cured of my dizziness and nausea—I haven’t even drank my oral electrolyte solution. This further supports my theory that this burger is drugged. Even Beloved agrees after effortlessly consuming her own Half-Pounder. Most of the time, when she gets more than a quarter pounder, I’m left to eat the last few bites of it. Her being able to consume an entire Half-Pounder is a first time. She commented that it was quite sloppy, probably from the blue cheese. Anyway, I was still wanting more. Knowing so, I had their Currywurst ready. 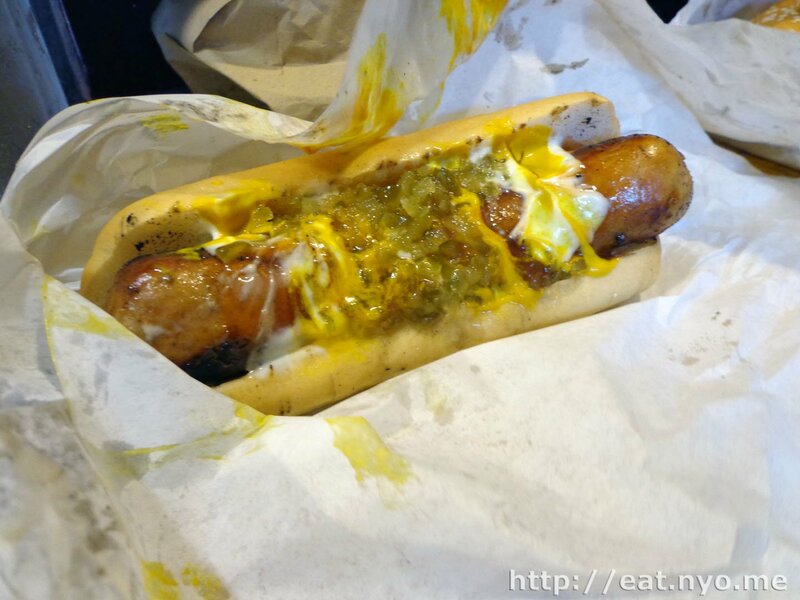 Like their Bockwurst, it was in a hotdog bun topped with pickled relish, mayo, ketchup, and mustard. Now, unlike their burgers, I can’t claim that this is the best sausage in town. However, it’s pretty good and filling. The added pickle relish is a plus for me as I’m quite fond of pickles, and I admit that I can taste a hint of curry (the spicy Indian, not Japanese) in the meat. There are only two flaws I can think of. One, is their drink and side choices. They only have Mug Root Beer and mineral water for their drinks and no sides whatsoever. The former is easily remedied since it’s close to a supermarket and you can buy a drink while they cook your order. The sides, on the other hand, is a pretty difficult solution. The closest fast food is Jollibee, and their fries definitely won’t complement such a masterpiece of a burger. If only the McDonald’s nearby didn’t close down years ago…. Second flaw is the place itself. Snack Shack is definitely not for large groups expecting to sit-down on comfortable chairs and nice tables. As I’ve mentioned, they can only seat four with a bar table, and it’s certainly not air-condition. You go here with the risk of smelling like delicious grilled meat and crying when you unluckily go in while they are chopping onions. I’m not really affected by this issue, but if you’re one of the fancy-types, you have been warned. Now, I mentioned a couple of blogs before that we’ll be doing revisits if needed. I have revisited this place quite a few times after, and, as I’ve written above, the quality certainly did not deteriorate. Maybe it’s even gotten better, but I can’t tell. All I’m sure of is, every time I eat a Half-Pounder from here, it’s always bitin. Anyway, in conclusion, I have just presented the best burger in town. If you haven’t tried it yet, I urge you to visit Snack Shack. I guarantee you’ll be craving for more. 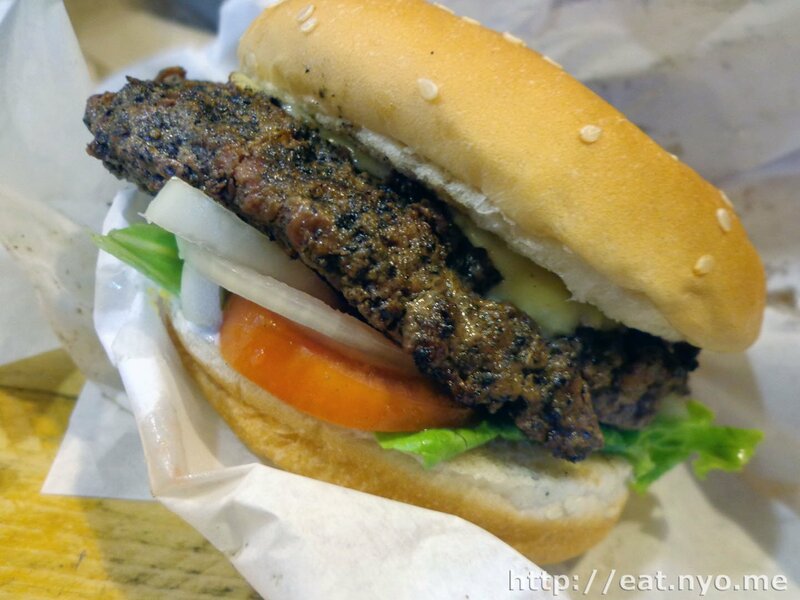 Smart nomnomnom tip: They deliver on select areas nearby: +639265122257.